Have your running times stopped improving, leaving you wondering what you can do to give it a kick-start? Are your training runs boring and you're looking for something to make it fun again? Have you reached a point where you just cannot squeeze any more running into your schedule because you'll get injured? Are you getting injured frequently? If any of these are happening to you, consider cross training (CT). Recent research shows that supplementing, or even replacing part of your running program with other forms of exercise might be just what you need to avoid boredom, minimize injuries, and take your running to a new level. What is cross training? The term refers to a wide variety of training activities that are not your primary focus (running), but may still have a positive crossover effect on your running. Indeed many coaches apply cross-training to experienced marathoners and beginners alike. Successful athletes in most sports practice some form of cross training. One of the strongest arguments in favor of cross training is that you can do extra endurance training with less strain on your running muscles and joints. It uses the same muscle groups in a different (non weight-bearing) way. This is most beneficial when the runner feels he is maxing out on his mileage, and (based on past experience) further running would precipitate injury. Even better for the runner on a plateau, is these added workouts can be done at high intensity, for increased gains in maximal oxygen uptake. A high intensity cycling session, for example, enables the runner to develop increased lactate tolerance, buffering capacity, and fuel resynthesis, without undergoing the high impact stress on the legs of an interval-training workout. A runner who already performs 2-3 high intensity workouts weekly, cannot add more running workouts at this level. But, throwing intense stairclimber or cycling session gives an extra workout that could help take him to a new level, without the added trauma of high intensity running. Research shows endurance type training does transform type IIa muscle fibers into type IIbs, meaning they've taken on endurance characteristics. With repetitive movement like running that operate through a restricted range of motion it's easy to overwork the same muscles and joints, leading to injuries. Cross training will re-establish symmetry between your muscle groups. By doing extra endurance work in low impact or low weight bearing aerobic activities like cycling, stair climbing, swimming, deep-water running, or using the elliptical trainer, you get an "active rest", with virtually no stress on your joints. But be careful that you don't emphasize one particular activity, so mix them up. A study by Murphy et al concluded that cross-training might not reduce injury rate. Another study found that, "cycling can be a great choice for runners to loosen the repetitive stress of running that contributes to overuse injuries. But cycling may come with its own set of problems, particularly back pain". What cross-training activities are complementary to running? Several activities have been shown to complement running effectively, including cycling, stair climbing, deep-water running, swimming, and using the elliptical trainer. Note that all these exercises use the legs for a major part of propulsion. Despite this similarity, an important principle of exercise science is glaringly defied by cross training - that of specificity. This aged principle states that if you are to improve in a specific sport, you should practice that activity solely, and by throwing other similar activities into the mix you confuse your neuromuscular system, thus actually retarding your running progress. According to one study, cross training did improve running performance, but not as much as a running only program. This explains why world-class athletes like Tour de France cyclists, for example, are not world-class marathoners. These elite cyclists exercise most of the muscle groups used in running, but in a very different way. But there is contradicting research showing that some activities can help improve other sports. A study by Ruby et al., had three groups of exercisers do a ten-week training program of running, or cycling, or a mixture of both. Their results found that all groups improved VO2 max. Another study (Millet et al), looked at cross-training effects in elite triathletes. It concluded that a certain amount of cross-transfer training occurs between cycling and running, but not with swimming. The results for both groups were almost identical, both groups improving VO2 max significantly, and reducing their 5 km run times by 7% (running only) and 8% (running/cycling). This showed that augmenting a running program with cycling showed no decrease in performance over a running only program. Another cycling/running study at the university of Toledo found similar results. The running/cycling group times came down by almost 30 seconds, from 18:16 to 17:48, or 3%, which was almost the same as the running only group's average. The conclusions were that adding extra running sessions was no better than adding extra cycling sessions. A California State University study also used two groups of runners for a study on cross-training. A running only group and a cycling only group performed a 9-week training program. At the end of the training both groups performed the same in running tests. At the very least, certain activities preserve and maintain running fitness while the runner is doing less, or even no, running. This in itself could be a reason for the runner to cross-train. He can cease running for a while, perhaps at the end of a grueling season, and switch to cross training for a physical and mental break without the fear of losing any fitness. Other non-weight bearing, low or no-impact activities such as aqua-running, and stair climbing, may also yield similar benefits. How then, can the runner use cross training to improve performance? And what activities are the best to help running? Perhaps we should first look at activities that are not ideal cross-training substitutes for runners. Any high impact sports (with the ground or other people), and sports that involve a lot of lateral bounding, or stop and go movements, should be avoided. These include soccer, tennis, racquetball, handball, volleyball, rugby, and aerobic dance. First, it's doubtful that cyclists could improve their cycling by adding running to their training schedules. It appears that cycling has a greater impact on running than vice versa (and swimming shows no correlation with improving running performance). It should be done at a fast cadence-similar to your running cadence with the resistance set to one that you can handle for intense 5-20 minute workouts. Make sure you are correctly aligned on the stationary bike. Adjust the seat height so your legs are almost straight at the furthest point of extension while cycling. Use the Stairmaster for a no impact workout. One study found that people who did stair-climbing workouts for 9 weeks improved their running performances. Not surprising, as this mimics uphill walking or jogging, which consistently rates near the top in terms of methods to improve VO2 max. The main criticism is that it's hard to set a fast step cadence on this machine. The elliptical or oval movement can be used backwards or forwards, providing the opposing muscle groups some balance in the workout. It works the gluteals and hamstrings, two important muscle groups for runners. Try several of these recommended cross-training methods. Decide whether you are going to substitute any of your training runs for cross-training activities, or if you're adding in one or two each week. Cross training is best added to your training program on your easy running or rest days. And always allow at least one complete rest day each week. If you're a semi-serious runner doing 3-5 days running each week, you can add in 1-2 days of cross training, or substitute 2-3 days with cross-training activities. If you're a competitive runner, with 6-7 days of running a week, you can substitute 1-2 workouts each week with cross-training. Keep your workout at high intensity to achieve improvement. And make sure you keep up your weekly long run-this should not be substituted with cross training. Gradually add in your cross-training workouts, instead of adding 2-3 in one week. Ask your fitness trainer to show you how to operate each piece of equipment before you use them. As a general rule, you can have as much as 50% of your total volume (in minutes of exercise) from cross training exercise in your off-season, and up to 25% in your competitive season. If your running schedule calls for a 30 minute run, attempt to exercise for 30 minutes on cross training equipment. While you're adjusting to the machines early in your workouts, you may not be able to complete a full 30-minute workout, so gradually build up your time on each machine or in the pool. Start at 10-15 minutes, and add 5 minutes on to each workout. It's a good idea to use a heart rate monitor to ensure you are getting full benefit from your cross training workout. Try to get your heart rate up to a similar level to what you run at, or at least within 10 beats per minute. You may not be able to get your HR right up to running levels because these cross-training exercises are non-or low weight bearing. Thus they don't use the legs as much for anti-gravity work, and to support your body mass. Of the studies done on cross training many indicate it is possible to improve your running performance by incorporating or substituting other aerobic activities into your training program. In addition, you may be able to squeeze one or two high intensity workouts in, on top of your regular running workouts, without the added impact trauma to muscles and joints. This should lead to reduced injury rates. But the devil's in the details-make sure you do high intensity cross training, rather than just "junk" time on the cross training equipment. 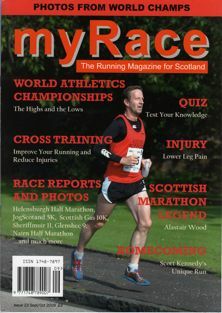 You can find additional running training information at my running training tips website.